Please be aware that if your purchase involves receiving additional information that cannot be downloaded from your registration email please allow 7-10 working days for this to be emailed to you. Please note if you are purchasing any of the items below in currency other than GBP, international currency conversion rates are applied depending on the purchase method and the date of purchase. 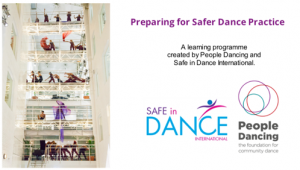 This four-unit online programme, developed by Safe in Dance International (SiDI) and People Dancing, enables access to learning without the need to attend a course in person. It provides any dance practitioner – teacher, leader, director or dancer – with the knowledge needed to integrate and manage safe and healthy practice principles into all dance learning or working environments. Applicable to all dance styles, from classical ballet and ballroom to hip-hop and Zumba, it can also be used in relation to any context, whether working with children or adults, beginners or professionals. This course contains all the content needed to undertake the Preparation for Healthy Dance Certificate, plus an introduction to other relevant SiDI Core Principles, such as warm up and cool down and working with dancers’ individual anomalies. It also awards 4 hours of Continuing Professional Development, endorsed by SiDI and the Council for Dance Education and Training (CDET). 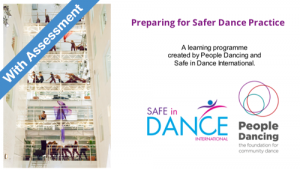 This four-unit online course, developed by People Dancing and Safe in Dance International (SiDI) provides any dance practitioner – teacher, leader, director or dancer – with the knowledge needed to integrate and manage safe and healthy practice principles into all learning or working environments. Applicable to all dance styles, from classical ballet and ballroom to hip-hop and Zumba it can also be used in relation to any context, whether working with children or adults, beginners or professionals. This purchase package also includes a professional review and endorsement of your knowledge and understanding in order to attain the Preparation for Healthy Dance Certificate (PHDC). The certification itself awards 6 hours of Continuing Professional Development, adding up to a total of 10 hours CPD including the course. The PHDC also represents Section One of the Healthy Dance Practice Certificate (HDPC) and the Healthy Dancer Certificate (HDC). If the PHDC is taken separately, it can be seen as a precursor to the other Certificates – it will not be necessary to repeat Section One if a Candidate subsequently would like to apply for the HDPC or the HDC. The online assessment leading to the Preparation for Healthy Dance Certificate (PHDC) is linked to Safe in Dance International’s Core Principle 1 “Dance Health and Safety”. It is not a course. This Certificate can be studied for independently or through the e-learning programme “Preparing for Safer Dance Practice” available above at a cost of £70. If you are interested in undertaking both the e-learning programme and this linked assessment there is a reduced joint purchase price of £95 giving a saving of £10 but these do have to be bought at the same time. See above to buy this combined package. This certificate awards 6 hours of Continuing Professional Development (CPD) from Safe in Dance International which is endorsed by The Council for Dance Education and Training (CDET) for its professional development programmes. It also gives international professional endorsement of your knowledge of this Core Principle from the National Institute of Dance Medicine and Science (NIDMS) and Healthy Dancer Canada (HDC), which agree it to be the minimum recommended international standard for Preparation for Dance Practice. This certificate is a precursor to our other two certificates, the Healthy Dancer and the Healthy Dance Practice Certificates (HDC or HDPC). It is not necessary to repeat Section One if a Candidate subsequently would like to apply for either of these. Please go to links for further information on these certificates. This certificate is the online assessment related to the e-learning programme Preparing for Safer Dance Practice. It is NOT a course. The Healthy Dancer Certificate (HDC) is based on Core Principles developed by SiDI and endorsed by leading members of the dance science community. It references up to date research in several key areas, knowledge of which is considered essential to support and encourage safe and healthy dance practice. In awarding this self-study Certificate, SiDI recognises and endorses the efforts of dancers working independently as they strive to minimise injury risk and optimise their own performance in the studio, practice or educational environment through their application of the healthy dance principles. The Healthy Dance Practice Certificate (HDPC) is based on Core Principles developed by SiDI and endorsed by leading members of the dance science community. Candidates reference research and practice in five Knowledge Areas, considered essential to support and encourage safe and healthy dance practice. In awarding the HDPC Certificate, SiDI provides international professional endorsement of a dance teacher or practitioner’s good or best practice in relation to the Core Principles. Those working in any genre and with dancers of any age or ability level, can evidence their efforts to minimise injury and optimise performance within their own practice or educational environment. The HDPC awards 60 hours of Continuing Professional Development that can be undertaken through self-study without the need to attend a course. The Certificate is fully endorsed and quality assured by the Council for Dance Education and Training: www.cdet.org. “The programme of Continuing Professional Development delivered by Safe in Dance International (SiDI) is endorsed by the Council for Dance Education and Training, confirming SiDI as a CDET Affiliate.” Glyn Jones, Director, CDET. Safe Dance Practice bridges the gap between research and application for dancers and dance educators at all levels. The book presents integrated guidelines and principles that will maximize physical and mental well being without compromising creativity and expression. Safe Dance Practice will resonate with readers who want their dance experience to be scientifically underpinned to support artistic freedom. This evidence-based research will enable readers to access wider sources of information to aid their ongoing development whilst empowering them to take responsibility for their own safe dance practice and that of others with whom they interact.